fuel for thought: What’s Better than Cheap CNG? Free CNG! Westport and Clean Energy Fuels are teaming up to give customers free fuel if they buy a qualifying Westport WiNG™ Power System powered Ford vehicle before December 31, 2013. Customers who order five or more vehicles will receive credits for free compressed natural gas (CNG) at any of the retail Clean Energy CNG stations across the United States. As leaders in the natural gas vehicle (NGV) industry, Westport and Clean Energy are working together to lead the transition to NGVs – vehicles using a cleaner fuel that is domestically abundant and more affordable than gasoline. The free fuel offer gives existing fleets, and fleets considering natural gas vehicles, the chance to enjoy the technology, performance and ease of refueling NGVs. The free fuel credits are being offered on a “first-come-first-served” basis, and up to 750,000 gasoline gallon equivalent (GGE) of CNG fuel will be given away by Westport during the promotion. 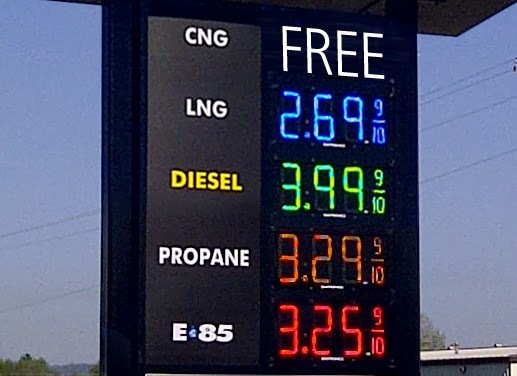 Fleets have until December 31, 2015 to use their free fuel credits. The number of credits provided to each fleet depends on the number of vehicles ordered – more trucks means more free fuel. For example, a fleet ordering five Westport WiNG powered Ford F-150 trucks will receive 500 GGEs of free CNG per truck. This can save fleets up to $10,755 in fuel and is equal to saving $1,195 on each CNG vehicle fuel system. A fleet that purchases 50 or more vehicles will receive 2,500 GGEs of free CNG per truck, equal to saving $239,000 in fuel or $4,780 on each CNG fuel system. It means lower operating costs and faster payback. Fleets operating on CNG alone can also take advantage of the free fuel with the purchase of Westport’s newest product offering: the dedicated Ford F-150 truck with the popular 3.7 liter V6 engine. The dedicated Westport CNG system offers 17 GGEs which provides approximately 250 miles of driving range. EPA certified, it’s available in Super Cab with the choice of either a 4x2 or 4x4 powertrain configuration.